You know that college remains one of the best ways to ensure a bright future for your children, right? And yet, the cost of college continues to rise at nearly twice the rate of inflation annually, making it increasingly difficult for normal families to afford this life-enriching experience. We help you solve this problem by teaching you creative strategies to reduce the cost of college, and find more money for college in places you didn't know about...so your child graduates with manageable (or no) student loan debt. You get detailed, easy to follow HD videos & supplemental resources that walk you through a proven strategy. With 25 years of experience, Matt Carpenter & Bill Rabbitt of College Funding Services (CFS) aim to educate families to avoid the many pitfalls of this process. Take advantage of our 25 years of combined experience, and benefit from all the lessons we've learned from helping 1000s of families save on the cost of college. See how most families’ approach to paying for college is all wrong, and avoid their mistakes. Learn a better way to fund your children's college education, and be sure you aren't over-paying. Get solutions for families that make too much for need-based financial aid, but not enough to write a check stress free for all 4 years. Get your Expected Family Contribution (EFC) down with creative financial strategies. Become a savvy shopper. Learn to identify the best value colleges based on aid awards, and more vital criteria you probably haven't considered. Capture value that's available to all family's regardless of income. Learn to confidently negotiate a better financial aid award. You make too much money for need-based financial aid, but not enough to write a tuition check stress free for 4 years. You feel stressed out by the whole college planning process. The rising cost of tuition has you terrified. You're afraid the choices are either: delay retirement, or stick your student with a huge debt load upon graduation. You feel "lost in the woods" and don't know where to get the best information & who to trust. How to NOT pay sticker price for college. Case studies to show you that there are still some surprises. Treat the college investment as if it were a mortgage. What happens when you make too much to get need based aid, but not enough to write a check stress-free for all 4 years? How to make the most of traditional borrowing options, without too much debt. How to confidently appeal your first financial aid award. How divorced & separated families can maximize aid allowance. How small business owners can maximize aid allowance. See how self-employed families can set themselves up for more benefits. Know how much a given college will actually cost your family way before you have to make a decision! Dedicated to ending the student loan crisis one family at a time, College Funding Services is the leader in the field for families who need help creating a plan to pay for their children's college down to the penny. Gen X parents will tell you their number one financial concern is paying for their children’s college. CFS takes the hassle out of creating a detailed college plan for your family. CFS are thought-leaders in college planning in America, and focus on a neglected area — helping families with the highly stressful and anxiety-filled college financial maze. When you learn how to pay for college like only CFS founders, Matt Carpenter & Bill Rabbitt, can teach you — you’ll soon find your stress levels reduced, and feel empowered with a more thorough college plan than you could ever create by yourself. Matt started CFS in 2005 after realizing both he and his parents had made some major mistakes in navigating the college admissions and financial aid processes. It became Matt's mission to show other families how to avoid making similar mistakes in one of the biggest investments of their life. Today, Matt is recognized as one of the nation's leading authorities within the College Funding niche. Together, with CFS, Matt has successfully guided thousands of families through the college financial aid maze. Matt grew up in the Birthplace of American Independence, otherwise known as Ipswich, MA. He graduated from Stonehill College in 2004 after enjoying a great career in the classroom, much less so on the football field. When he's not busy saving families from the college loan crisis, Matt enjoys hanging out with his wife Rosey, their daughter Emma, and their lab Tommy. They reside in Beverly, MA. When the Carpenters aren't passionately supporting one of their favorite Boston teams, you might catch them at the beach, traveling, or attending a concert from any of these life-enhancing bands: My Morning Jacket, Band of Horses, Bruce Springsteen, Bon Iver or The War on Drugs. Bill started working with CFS in 2007 by helping found the NY/NJ office and is currently COO and Managing Partner. Bill's passion for the college funding space came from personal experience. Being 1 of 4 children of a blue-collar family, he witnessed his parents struggle to put 4 kids through college. He saw first hand the fear, anxiety, and stress that the process brought with it. His personal mission is to help families navigate this process in a strategic and fully educated way so as to limit the stress and cost as much as possible. Today, Bill is recognized as one of the nation's leading authorities within the College Funding space. Bill has worked with a countless number of families from every demographic, as well as, dozens of organizations throughout the country. They did a great job for us at a fair price. As it turned out the service provided paid for itself with the funding we were able to receive. "When it comes to college funding advice it is hard to know who to trust. Matt Carpenter, Bill Rabbitt, and the team at College Funding Services truly put families first. You won't find a team more passionate and experienced in providing advice and guidance to help your family make a smart college choice. The strategies and tips outlined in How To Pay for College 101 will teach you exactly what you need to know to reduce the cost of college for your family." Joe Messinger, CFP®, ChFC®, CLU®, is partner and director of college planning at Capstone Wealth Partners. Captone's College Pre Approval™ process guides clients through a process that allows families to save the money they need, and eliminate the stress & anxiety they have around paying for college. 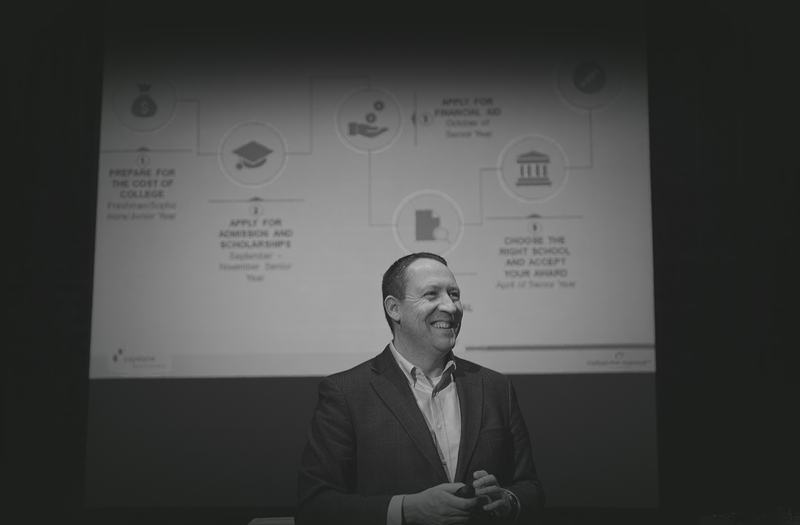 In addition to working the front lines and helping families plan for college, Joe is a respected thought leader amongst financial advisors for his unique approach to college funding. Are you ready to become an educated college consumer?